Getting married is one of the most important events of your life and you’ll want to have wonderful photographic memories of it for years to come. There is nothing to match the immediacy and spontaneity of a still photograph. It captures a fleeting moment in time, an expression, a detail that you can revisit time and time again. It has been said that all you eventually remember about your wedding is what is in the photographs….as other memories fade, your photos are still there to remind you of that important life-changing day. Having a pre-wedding shoot with your partner will ensure that you become relaxed in front of the photographer and will help you to banish any nerves on the wedding day. Most brides have a “trying on” session before the wedding, perhaps with their hair dressed as it will be worn on the day and with their chosen make-up colours. Why not combine that with a studio photoshoot to achieve a beautiful romantic bridal portrait? Speak to your minister/registrar beforehand and ensure that you can have photos taken of the ceremony. Most will allow that but may have some ground rules. Compile a list of any formal photographs and groups that you want to have taken and make sure that someone (e.g. the Best Man) can help to assemble them for the photos. On the day, the most important thing is to enjoy yourself! That applies to the photographer too by the way! Relax and have a ball and your photos will be fantastic! 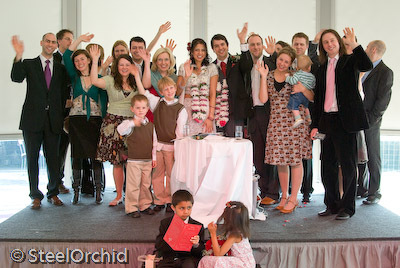 Our SteelOrchid approach to wedding photography is relaxed and natural. Working together from different vantage points, we will quietly watch for spontaneous events and capture them. There will usually be a short formal session when the family groups are being taken, but even those need not be tiresome…again the best photos will come from relaxed moments…so we don’t get impatient and bossy…we just tease you gently into place. Everything is done at your own pace. At the reception we specialise in capturing close ups…you’ll probably never even notice you’re being photographed…! Have a look at some of them in our “Faces” gallery. So relax, have fun and let Mike and me do the rest.